I'm thrilled to feature a guest post today written by my friend Karla Holley of the blog Small Town Rambler. The internet is a lonely place at times but it can also lead to some wonderful moments of connection. A set of mid-century modern chairs (walnut Krueger Matrix chairs to be exact) first brought Karla and I together when she reached out to me as a mid-century modern design specialist, and in the time since that first contact, I'm proud to consider Karla a friend and very grateful she has chosen to share her experiences here. Karla's account of what she learned through the process of deciding what to keep following the passing of both her grandmothers reminds me so much of what I witness with my appraisal clients. As a USPAP-compliant appraiser, I am bound by confidentiality in my work, so I am especially delighted to be able to post Karla's first-person account. I especially love how Karla empowers her readers to envision new ways to style antiques and heirlooms rather than sending them to the dumpster and buying new mass-produced furniture, which is a topic close to my own heart as an appraiser. Best of all, she's one of those genuinely kind individuals who are always delightful to encounter in one's journey through life. Deciding what to keep when a loved one dies can be a difficult decision. Going through belongings that hold many memories or have value can bring up a lot of emotions, which can make the task even more difficult. I lost both of my Grandmothers in the past five years (both of whom were widowed) and my husband was the Executor of my maternal Grandmother's estate when she died in 2012. My emotions were all over the place when she died because her death was unexpected, so I had a hard time letting go of her things. I didn't want to let go of my Grandparents (I was very close to both of them), so in my mind, holding on to them was holding on to their "stuff." We use most of the things we kept but I realize now that when my emotions are making the decisions, I tend to go overboard and I held on to some things that I didn't know what to do with or that didn't serve a purpose. When my other Grandmother passed away over the summer, my prior experience put things in perspective and I was able to give more thought to things that were important to me, and ask for those particular items. My paternal Grandparents had a lot more children and Grandchildren than my other Grandparents had, so many of their things already had a home to go to, which was nice! Since this experience is still fresh in my mind, I'd like to share a few things that I feel are important questions to ask yourself before deciding what to keep AND some ways you can use these things in your own home. I hope you find this helpful! 1. Will you use it? Will you REALLY use it? I ended up with some things I thought I would use, but never used them. I don't even drink wine and took home two corkscrews. I didn't really need another set of nylon cooking utensils. I also never really had any interest in sewing, so the hundreds of spools filled with thread just became clutter. More to dig through in the kitchen drawers and threads and scissors, and scissors, and more scissors in my craft area. I used the pinking shears once while making a neat pattern at the edge of some craft paper for a project, but that's it. Anyway, you get the picture. The thought of letting go of my Grandmother's sewing supplies felt like I was losing that part of her but I never really had an interest in sewing. I've decided I'm going to use her sewing cabinet as a record cabinet and the spools, scissors, and outdated fabric have to go. If I had asked myself that question five years ago and really taken the time to think about it, I wouldn't have so much to sort through now and had things in the way all this time. I think it's okay to have a few things just to display for decoration that you may not use, but if you're taking things that will become clutter or that you have to store, you'll definitely want to think about the answer to this question. I'm one who loves dishes and using a mix of pretty pieces when I entertain company, so taking my Great-Grandmother's china set was a clear decision. 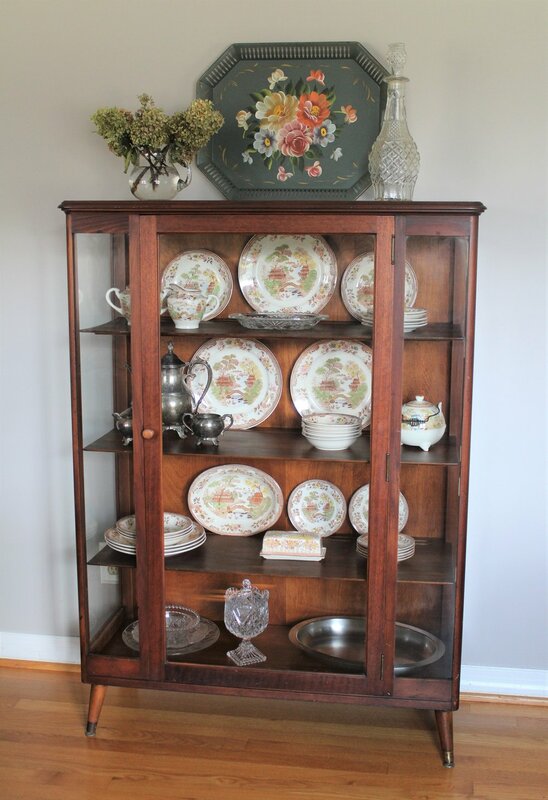 I loved the pattern and I am able to nicely display it in this vintage display cabinet, which was also passed down to me. The silver set inside the cabinet would be an example of something I wouldn't use but enjoy displaying because it was one of my Grandparent's wedding gifts. 2. Can you use it to decorate or repurpose? I really loved this old rustic gate I found at my Husband's Grandparent's farm and wanted to use it somewhere in the house where it could easily be seen. It was sitting outside in one of the buildings and no one else wanted it. I was so happy when I found the perfect place to display it! I knew it would make a pretty decorative piece and the simple silk huckleberry wreath was a nice touch. The glass pitcher holding the fresh tulips is also displayed on the china cabinet above. I've used it as a pretty vase for my fresh-cut flowers and it's a nice way to remember my Grandmother. This turquoise table was in such bad shape that the auctioneers wouldn't even take it when they were clearing out the rest of the furniture from my Grandparent's house. I loved it because it stored my Grandaddy's butchering equipment and I thought of it as a special piece, but how could I use it? I refinished the top with stain and outdoor polyurethane and the bottom part with an outdoor paint and now we are using it as a serving buffet and grilling station on our deck. It's wonderful for outdoor entertaining! My Grandfather's butcher block is a very special piece but I did not want it sitting in a dark corner of the basement just to say I have it. It did sit in the basement for a year or two until I convinced my husband that it would make a nice kitchen island. It's very functional for extra storage underneath and the wood block on the top has been the perfect place to prepare food. What makes it so special is the story. It was my Grandfather's first butcher block he used when he was a butcher at the old A & P grocery store in downtown Waynesboro. Having a piece of family and local history in our kitchen makes a nice conversation piece, and it's usually the first thing people notice when they walk into our kitchen. 4. Does it hold a special memory? Is there something in particular that reminds you of the time you spent with your loved-ones, or that brings back special memories? 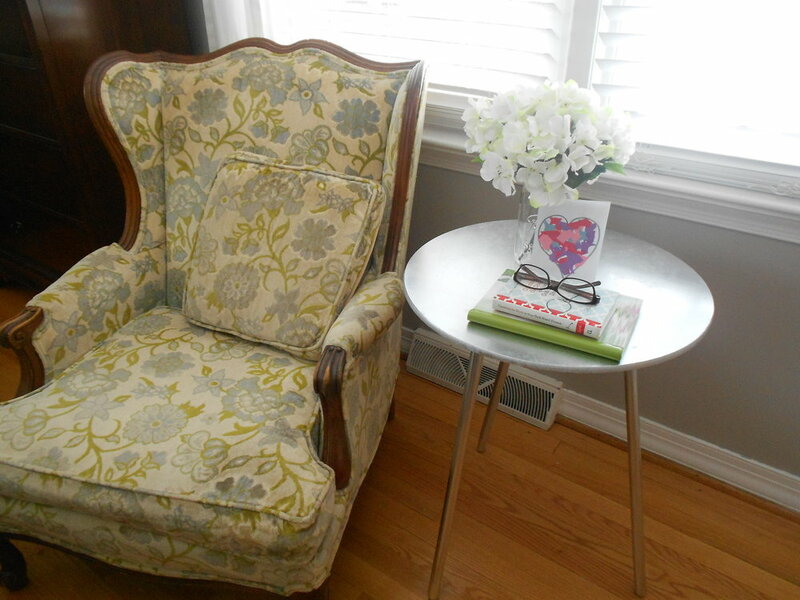 I knew right away that I wanted these floral wing-back chairs that my Gramma purchased when her kids were small. She had them long before I was born and we have so many family photos with these chairs in the background. Blue was her color, so that is a nice reminder as well. I have so many memories of my Grandparents' attached to these chairs and I am so thankful I have them, I even bought a blue and white duvet cover for our bedroom just so it would match with the chair. We have the other chair sitting in my husband's music room. I love these chairs and I hope they stay in the family for generations to come! If you are currently in the process of sorting through your loved-one's things or if it's something you will do in the future, I hope you find this to be helpful. My heart goes out to you because it is not an easy thing to do and our emotions are just part of the process... and that's normal! Just take the time to consider these questions and realize that if they do not have a special memory attached or you cannot use them in your own home, then they are just things. Even the things you can sell to turn a profit are just that. I have a few things from my Grandparents that might be worth a fair amount of money but I have never been interested in pricing them because to me, they are priceless, and are not for sale. Many thanks to Karla for kindly sharing this! All of the images featured here belong to Karla and can be found at Small Town Rambler.